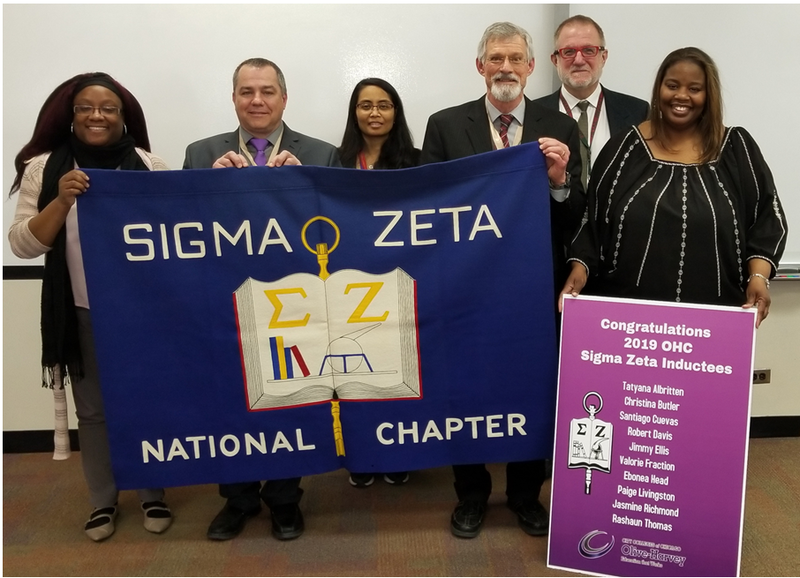 The 2019 Sigma Zeta National Convention Service Committee selected the theme of To promote community between disciplines and to disseminate scientific information in an ethical and accessible manner both to other scientists and the larger global community. This year’s National Service Project seeks to pull these purposes out of the abstract and place them into the realm of actionable reality. It is no longer feasible to make broad prescriptive statements of intention when so many people in our world suffer at the hands of ignorance and misinformation, and so we are going to ask every chapter to participate actively in our goal to educate. Active members have been given the opportunity to study the intricate truths of science, and have proven themselves quite capable in their individual fields of study. As such, they have a the precious ability to find the connections between their work and the work of others, and can teach the truth to those that most need it. With this in mind, we ask this of all the chapters: find a way to promote scientific literacy both on your campus and in your community. Ask around for the topics people do not understand, and band together within Sigma Zeta and between other honoraries and scientific societies to answer these questions and fight ignorance with truth and compassion. Get into your local schools and do science fairs with the kids, partner with local hospitals to provide information to patients and volunteer hours, search for the strengths in your chapter and use those internal strengths to strengthen the human family with knowledge. 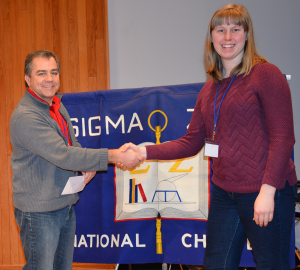 We can push back against ignorance if Sigma Zeta members get on the ground and teach with their fellow scientists. Share what your local chapter is doing to promote community between disciplines and to disseminate scientific information..
Student participants! please take the following survey. Thank you in advance! Sigma Zeta National Officers met on Saturday, November 3, 2018 in New Orleans, LA. The main agenda item was the review of 23 requests for research awards from Sigma Zeta student members across the country. Get a Good Start on the New Year! 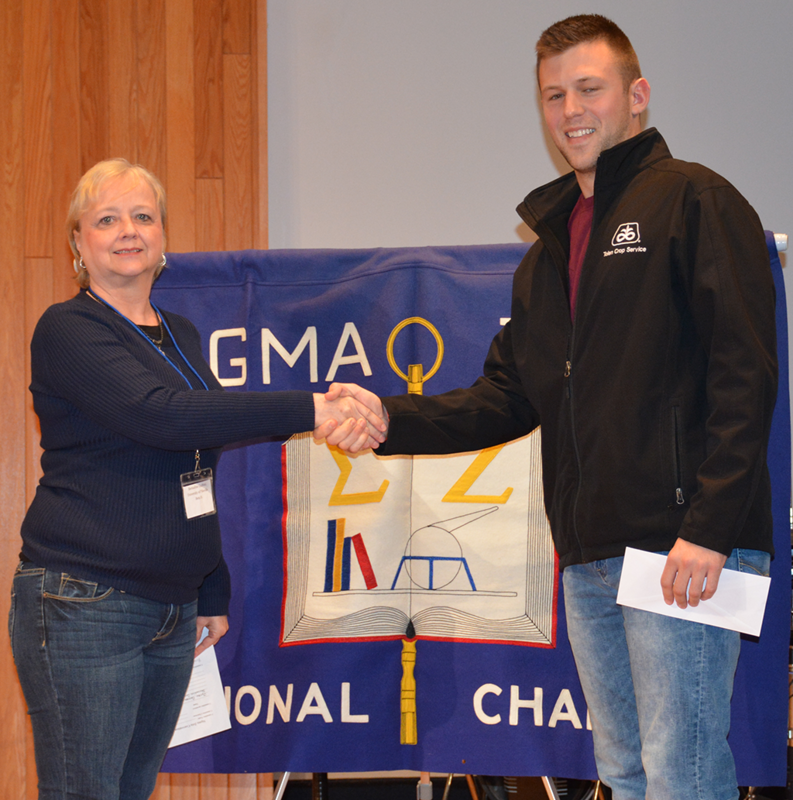 As chapters become more active in the fall, don't forget to share both what happened in your chapter this last year and also submit your list of newly elected officers. Use the Chapter Officer List Report Form to submit your officers and you can also check to see if your chapter's report has been submitted on the Local Campus Chapter Officers page. Use the Chapter Annual Report Form to submit your Chapter's activites. 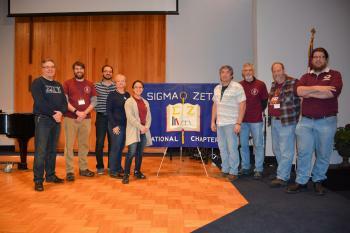 Sigma Zeta members!! We encourage you to apply for the 2019-20 Research Awards. Last year twenty-three research proposals were reviewed at the Nov. 4 officers meeting and 23 proposals were awarded. Research awards are an opportunity to seek funding for your research with the expectation that you will present your research at the National Convention. 2019-20 Applications will be due prior to October 21, 2019. Plan ahead to apply now! Sigma Zeta Research Awards are granted annually to support quality research by student members of Sigma Zeta. Students need to submit applications by October 21. 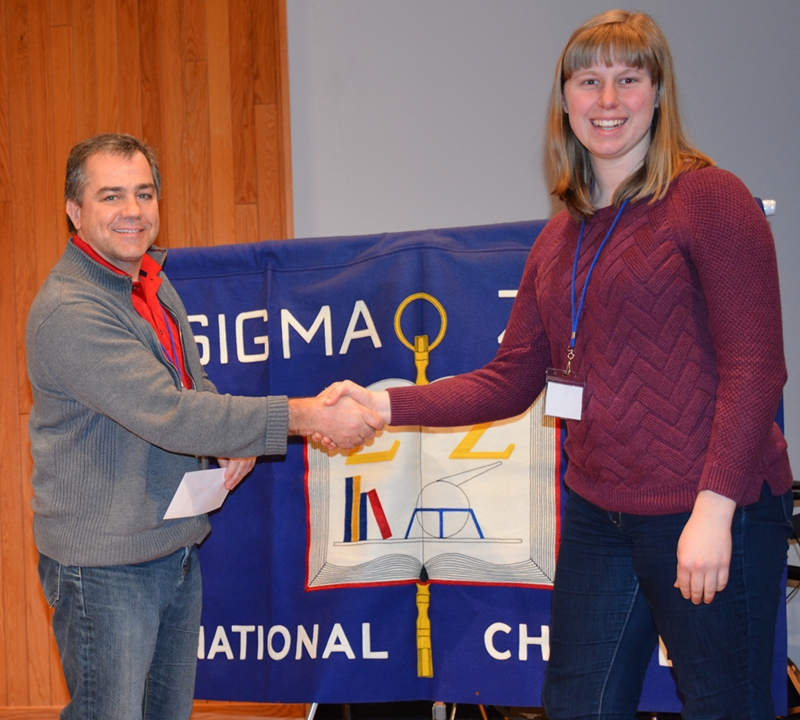 Welcome to the newest member of the Sigma Zeta family: Olive-Harvey College Associate Chapter! 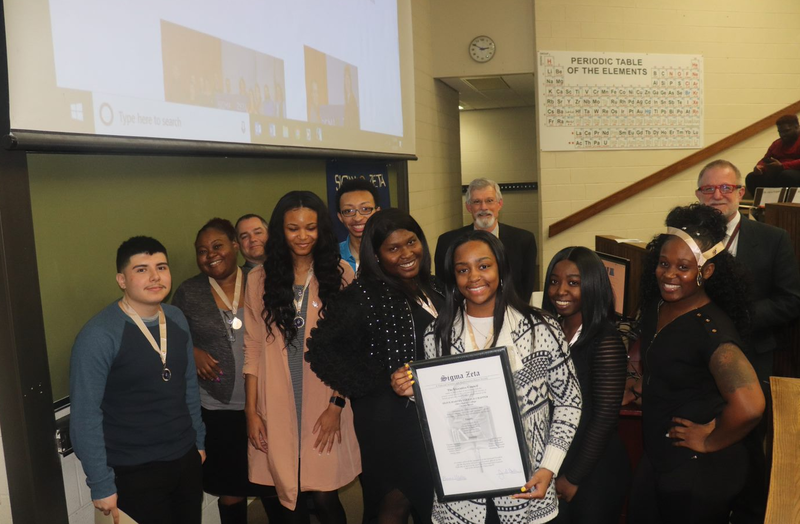 The chartering ceremony took place April 5th, 2019 where 10 students and 5 faculty became charter members. 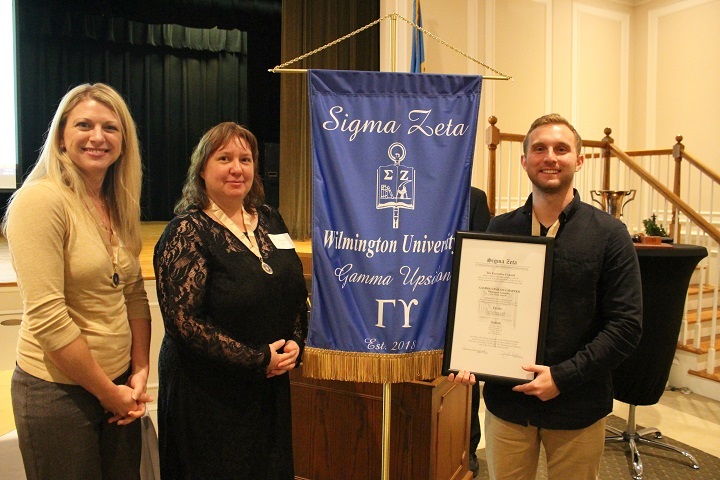 Faulkner University in Montgomery, AL was approved by the National officers to become the newest chapter of Sigma Zeta. They will be joining us as the Gamma Tau chapter in their chartering ceremony on October 11. WELCOME GAMMA TAU!! Abigail C. Burnett, Nicole Lisek, Anthony Wilson, and Adam Travis. Gamma Eta. An Evaluation of the Efficacy of Echinocandins and Triazoles on Reducing the Viability of Quiescent C. albican. Alexis Guttormson. Gamma Gamma. Identifying white-footed mice (Peromyscus leucopus) and deer mice (P. maniculatus) using cellulose acetate electrophoresis of salivary amylase. Elli Strand. Gamma Gamma. Use of Cellulose Acetate Electrophoresis for Salivary Amylase to Differentiate Between White-footed (Peromyscus leucopus) and Deer (P. maniculatus) mice. John Migliore. Beta Iota Screening for naturally occurring antibiotics. Joshua Yount. Gamma Kappa. 3D Printing of Habitable Aerodynamic Structures. Kegan Main and Jonas Smith. Gamma Eta Categorization of Head and Neck Cancer Cell Lines Through Phenotypic Specific Migration. Korbyn Dahlquist. Beta Iota. The role of lipolysis and lipophagy in NAFLD. Kristen Buss. Gamma Eta. Correlation of Low Doses of Actinomycin D Chemotherapy on Multiple Human Cancer Cell Lines with Increased Nucleolar Amplification. Leah Noe. Gamma Eta. Selective Inhibition of Aspartate Aminotransferase by L-Cycloserine in the Presence of Vitamin B₆ to Test Glutamate Concentration Levels. Levi Coyle. Beta Eta. Comparison of the effects of tilapia and bluegills in a small-scale private aquaponics system. Maggie Crider and Megan Andersen. Beta Eta. Isolation, identification and antimicrobial activity of local fungi in the context of middle school STEM mentorship and outreach. Megan Desoriers. Gamma Eta.Isolation and Identification of Multi-Drug Resistant (MDR) Bacteria in an Urban Wetland Ecosystem. Mollie Francis. Gamma Gamma.Comparative Analysis of Squirrel Behavior and Habitat use in Light of Climate Change. Nicholas Arroyo. Gamma Sigma. Reversing cancer phenotypes in Vero cells by overexpressing tumor suppressor, p16INK4a. Rachel Hurrell, Christopher Jones, Jackson Miller. Rho.High-Performance Liquid Chromatography (HPLC). Sonja Gilje. Gamma Gamma.Using Radio Telemetry to Assess the Behaviors and Habitat Use of Urban Grey Squirrels (Sciurus carolinensis) and Potential Competition with Red Squirrels (Tamiasciurus hudsonicus). Aaron Williams. Sigma.Caenorhabditis elegans Health and Longevity on the Bacteria Citrobacter freundii in Comparison to Escherichia coli. Stephanie Martinez. Sigma.Dietary Effects of Bacillus cereus and Escherichia coli on C. elegans Health. WuShuang Yang, Htoo Thu, Brittany Fahringer, and Mason Mockobee. Gamma Eta.Supplementation of Metformin with Vitamin D to Improve Glucose Uptake and Lower Triglyceride Levels in Drosophila melanogaster. Isaac Lies. Gamma Mu.Comparison of different engineering models of Narrow Bipolar Pulses. Olivia Sirpella. Beta Chi.Functional Aspects of SOX18 variant E137K on Transcriptional Activity. Shannon Taylor, Kyle Palermo, and Adam Schuder. Gamma Eta.Elucidating L-Leucine Protein Synthesis Pathways in Yeast Using Gcn4 Depletion Strain and Rapamycin. Abbegale Reeves. Gamma Kappa.3D Printing of Upper Extremity Prosthetics and Translation of Pressure Sensors to Activation. Chapters are encouraged to share Sigma Zeta events and milestones on your local campus and with the National Chapter. Gather a group of science and math students and faculty interested in a science honor society for all science and math students. 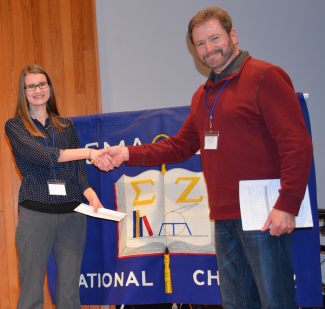 Sigma Zeta includes all science and Math oriented departments, majors, and students. 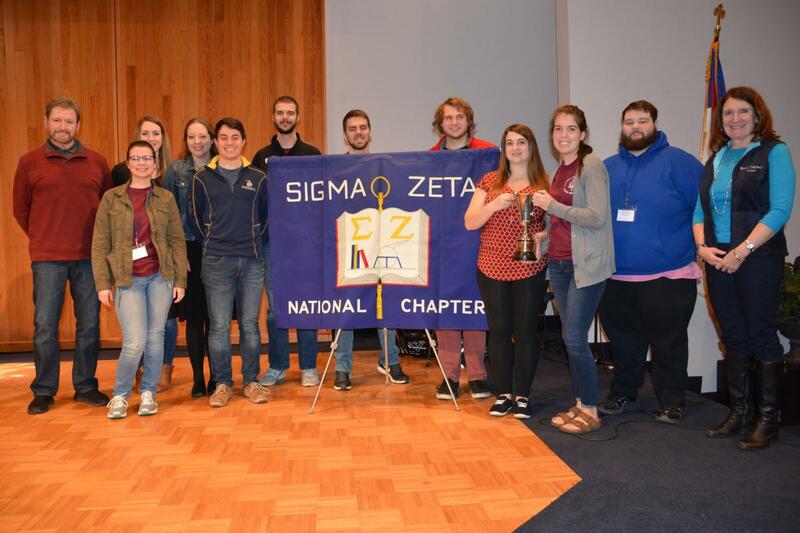 Especially important is one or more faculty willing to actively encourage and support your local Sigma Zeta chapter and to hopefully also become involved with the National Sigma Zeta organization. Submit a new chapter application form. Thanks to all for a great 2018 Convention. 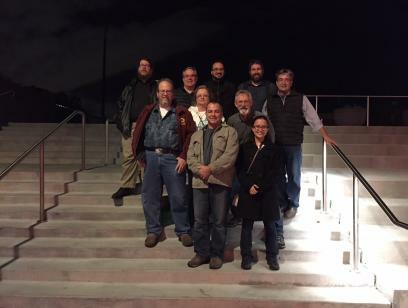 Below are highlights of the convention, including awards, committee reports, and more. If you chaired a committee, please submit your Committee Report Form. You asked, now order soon! 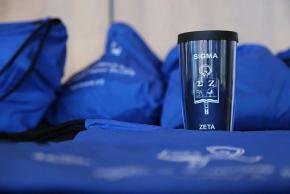 Sigma Zeta branded items available in the Sigma Zeta Store. Talk to your chapter advisor or officers to place an order for one or all chapter members. Plan Your Sigma Zeta Year Now! Planning your yearly chapter activity calendar is a great way to start the chapter year. 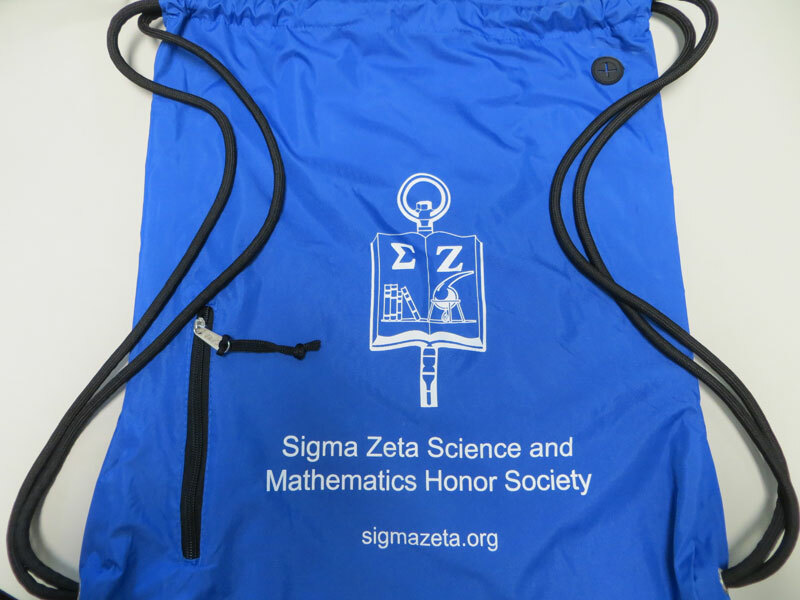 Purchase your Sigma Zeta Honors Medallions and Pins for the academic year early. Try to order at least 30 days in advance so that you can have them when needed. 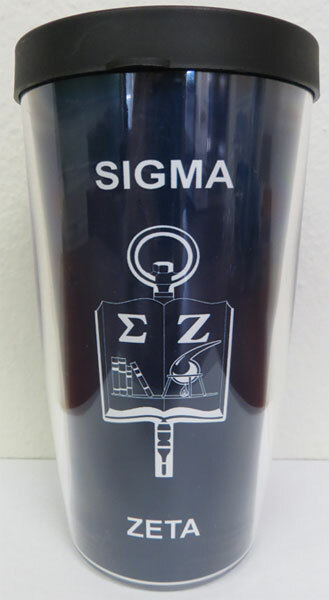 Also available are Sigma Zeta branded nalgene water bottles, tumblers, and sackpacks.